Ferroli has been manufacturing central heating boilers for almost 60 years. Their products are manufactured in Italy and are known for producing reliable yet affordable combi, system and vent-only central heating boilers which can be used with natural gas and LPG. Today, the Italian manufacturer prides itself on producing highly efficient affordable boilers like the popular Ferroli Modena HE range, which is designed to be energy efficient to keep home heating bills as low as possible. The Ferroli 38c Modena HE combi boiler is aimed at meeting the heating and hot water needs of larger domestic homes. With its mighty 38kW output, the latest addition to Modena HE range of high efficiency boilers is more than up to the job. A powerful boiler with a low operating noise level, the Modena HE 38kW is surprisingly small, light and very energy efficient. Compact in size – at only 600 x 400 x 350mm – compared to the 27kW and 32kW models it’s only an extra 30mm in depth and weighs just 1.5kg more than other boilers in the range. The 38kW combi also delivers excellent domestic hot water flow rates. According to the manufacturer, max DHW production @ 25°C /35°C rise l/min is 21.8/16.0. And with up to 60m reach flueing options, the boiler is an ideal choice when the time comes to replace your old inefficient boiler with a new energy saving version. Installing the Ferroli 38 kW Modena HE combi will benefit your home by cutting both your energy bills and carbon footprint. They are easy to install and can be fitted much quicker compared to comparable combi boilers. It helps keep costs down in the case of repair and also adds to the boiler’s affordability. 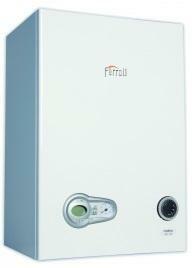 Ferroli manufacture and supply boilers and heating appliances. They are one of the leading heating appliance design and development firms in the world.